Picture it's your first time coming to small group at church. You picked a comfy chair, they leader has gone around the room to introduce everyone. And now we're digging into the material. The book study questions start with some verses to read. And the leader asks YOU to read the first verse. What?! Why! Can't we all just read it silently in our heads! We have the app on our phones, let's listen to the audio play. For your next personal time, try reading your Bible out loud. Slow down your reading and really hear the words. Bonus, you'll be extra prepared for small group. In The Joyful Stepmom Facebook group we like to do Bible studies together. Right now, we are not formally going through a book. But so many of us are reading "It's Not Supposed to be This Way" by Lysa Terkeurst that we are sharing our thoughts or snippets as we go. I've written all over my copy and have so many things I want to share with you! I'd probably just end up typing out a whole chapter. If you haven't grabbed a copy, I highly recommend it. So I'll share one little clip from Chapter 3: Lysa writes "Jesus had many marked moments. We often read how Jesus got away to pray and be with His Father. He would face something and need a marked moment with His Father to trade His human desire for Gods will." Marked moments. I love that. Yesterday I had a lunch with my parents. It's special because they recently moved back to the area and we can do this now. I had news, they had news. We marked the moment. It's what we do! Even if the news isn't important, we call up our people and share. And we need to that with God, our loving Father. He's just waiting for us to share whatever it is! With Him. So let's be sure we are truly marking the moments in prayer and conversation with Our Father. I am by no means a tech savvy, social media guru. But I know enough to find my way around, click here and there to figure a few things out. I'm sure you feel very secure right now. Ha! 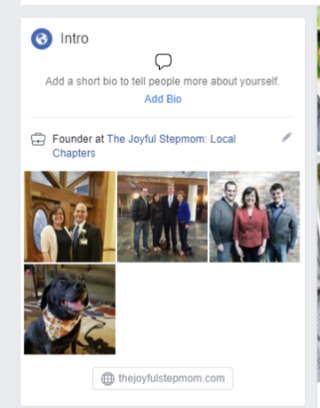 We have had a number of requests in the last couple weeks at The Joyful Stepmom regarding Facebook profile privacy. We usually have members post asking for help on what can be seen and how to shut their profile down. This is a very good question. We should all be in the habit of watching what we post on social media and being aware of how to protect our privacy. At The Joyful Stepmom, we feel particularly strongly on this area. There is no reason that something you post on social media should spill over into your real life. It's unnecessary drama. 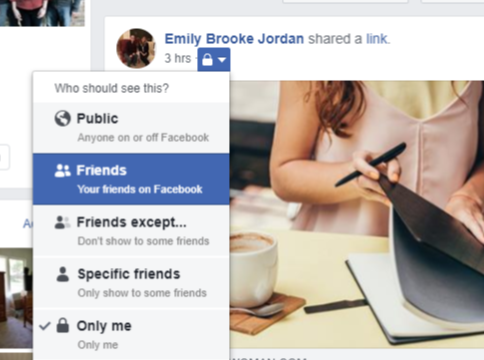 So in order to help you take care of yourself, your family and just be a good social media citizen, I've put together a few quick ways you can keep an eye on your Facebook profile. I'm focusing on Facebook because The Joyful Stepmom online community is mainly based on that platform. We should strive for the same measures across the internet. 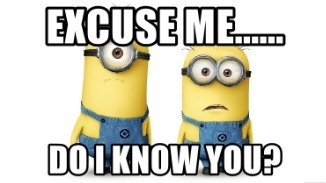 Number 1 Rule of Thumb: Watch your friend list. When accepting friend requests, ask yourself basic questions: Do you know this person? How? Well enough to see pictures of your family and your location? If you are experiencing some privacy issues, this is a good time to purge your list. Scroll through every friend profile and get rid of those who have left Facebook, you don't remember who they are, etc. Number 2: Review your timeline. Next time you are binge watching Netflix, take out your phone and scroll your own profile. Start deleting. What should you delete? We all share things we thought were funny, we wanted to remind ourselves about a sale, win a prize, show our spouse or kids. It's probably over now- delete. Why? "Once it's on the internet, it's always there." That may be true in some deep dark way. But you can end the cycle of people clicking around on links and memes and making their way to your profile from something you shared 3 years ago. Untag yourself from pictures. It is amazing to me how I can click through different mutual friends and end up 7 people deep just because we are all tagged in pictures and we leave it public. We do that because we love each other and we want to share our good time! But someone with ill intentions can easily follow the trail. If you have someone stalking your profile, shut it down. Untag or if you have control of the picture, make it Friends Only. How do you know who can see a post? Check that privacy setting symbol! Facebook knows this is important! And they have easy ways to show who can see what you have posted. You can also easily edit and change this by hovering over the post. This is a great time to start changing your posting behavior! From now on, pay attention to this setting. When you share a post to your own timeline or just write something, you have complete control over this. Here is a nifty feature I just noticed on my laptop. 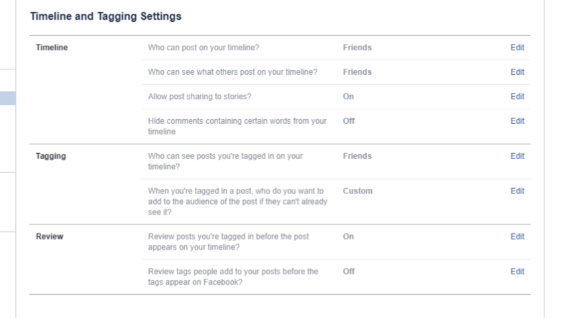 If you scroll your profile up a little, this option to Manage Posts appears. Click and you can delete or change the privacy setting. Really cool, Facebook! Thanks! Number 3- Change your settings. You may need to wait for the Netflix show to end. This takes a little more focus to make sure you have everything set just like you want. Right on your profile header are 3 dots where you hover and select Timeline Settings. This is where you "lock it down." Read each section carefully. Google what you don't understand. Facebook has good descriptions in their help section as well. And lastly, don't forget that fun Bio/ Intro/ Feature section. We like to put inspirational quotes, list our kids names, the dates of our marriage, birthdays....whoa! Please remember this section is all incredibly public! Think carefully about how much you want or need to share. Edit or delete. Each individual section has an edit button. You are giving away vital privacy information about yourself and your children. Your location and job information can be made private or for friends only. And those Feature photos are so fun! But they are just that- featured and very public. If you have privacy concerns or someone stalking your profile, lock it down. Keep those fun pictures for your friends who have good intentions at heart. I hope this has been helpful in answering a few of the concerns we've seen from our stepmom community.